ItemBARK_1980.0112.0005 - A group of unidentified Chinese men in suits. Several wear matching pins on their lapels. Ken Wong is fourth from left. Item BARK_1980.0112.0005 - A group of unidentified Chinese men in suits. Several wear matching pins on their lapels. Ken Wong is fourth from left. A black and white Postcard. This postcard shows ten unidentified Chinese men standing on a front porch of a unidentified building. At the front of this building there is two signs above the door way. These signs are printed in Chinese characters. There is also a fence on this front porch. There is also a window on each side of the doorway. L.13.8cm W.8.6cm Post card was mailed from Port Arthur Ontario on July 12, 1939. It is addressed to Mrs. Lee Chong, Box 57, Barkerville, BC. There are three columns of chinese characters hand wretten on the left side of the back of the card. 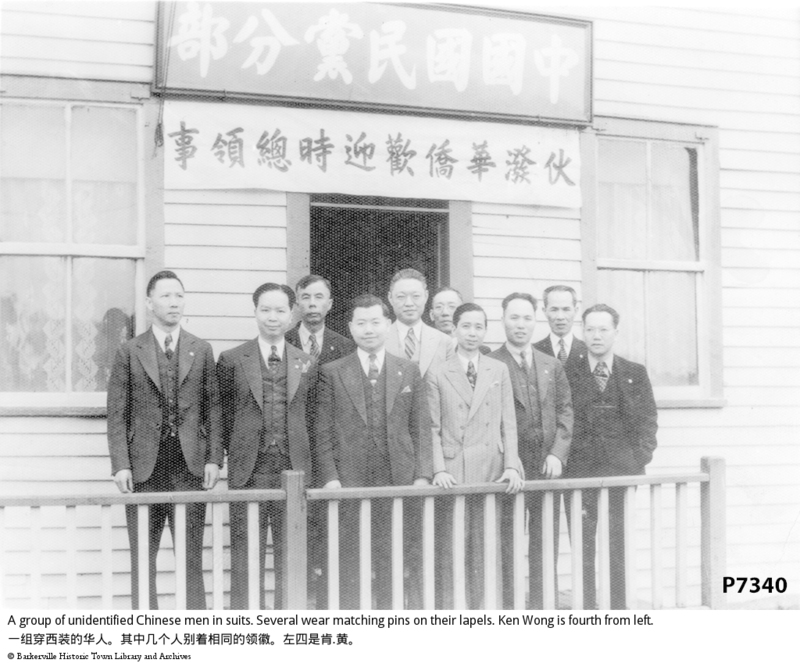 Fourth man from left may be Ken Wong, Beatrice Keen's husband. Translaton of inscription: "The one in the middle wearing glasses is Consul Hui. Taken on June 21st. Mailed by Jie"